How do I manually log touchpoints in Gem? Gem helps to automate email Sequences for candidates, but there may be times where you send an Inmail outside of Gem or message a candidate via a different medium. In those cases, you can still have those metrics tracked in Gem. We've built the ability for you to manually log touchpoints for candidates that will track over into your Outreach Stats. This article covers what types of Touchpoints you can manually log, how to log touchpoints for an individual candidate, and how to log touchpoints in Bulk. You can log manual touchpoints for an individual candidate right from their Gem profile or from the Gem extension. To do this, navigate to that candidate's Gem profile and open up the Gem extension. 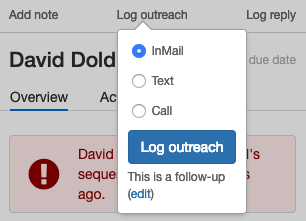 From there, press the 'Log Outreach' button and then select the type of manual touchpoint that you want to log. You can also toggle whether this is a follow-up or an initial outreach by pressing the 'edit' button in parentheses. 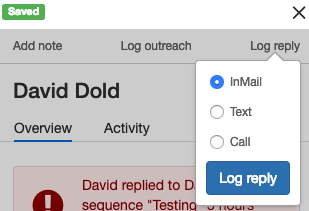 You can log that an individual candidate has replied to a manual touchpoint by pressing the 'Log Reply' button, and then selecting what medium the candidate replied through (Inmail, Text, Call). Gem also allows you to log manual touchpoints in bulk from a Project page. You can do this by navigating to any project and then pressing the checkbox next to candidates you want to log manual touchpoints for. 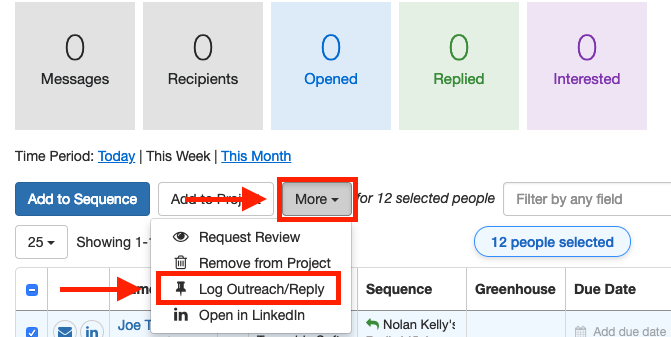 Once you've selected the candidates you'd like to add manual touchpoints for, press the 'More' button and select 'Log Outreach/Reply'. Gem will open a window asking you to select the type of outreach (Inmail, Text, Call) and whether it's an Initial Outreach, Follow-up, or Reply. 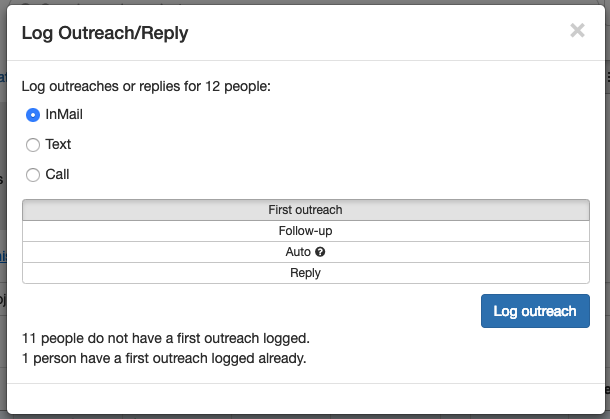 You can select Auto if you would like Gem to automatically choose whether it's an Initial Outreach or Follow-up based on previous outreach. 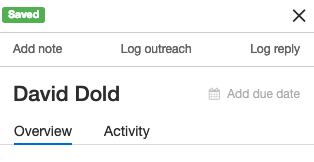 Once you press 'Log Outreach', Gem will log those touchpoints and you will be able to see them in your Outreach Metrics. Need help with manual touchpoints in Gem? Feel free to reach out to the Gem team by emailing us directly at support@gem.com or press "Chat with Us" in the Gem home page.